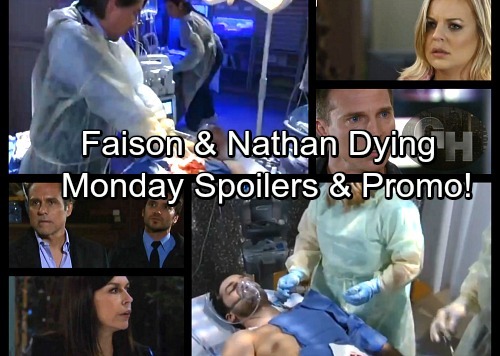 General Hospital (GH) spoilers for Monday, January 29, tease that Nathan (Ryan Paevey) will be in a fight for his life at the hospital. As Nathan’s heart stops beating, Griffin (Matt Cohen) will rush over to give him CPR. Faison (Anders Hove) will be in a similar situation nearby. Finn (Michael Easton) will do whatever he can to save this scoundrel, which is exactly what Jason (Steve Burton) wants. If Faison survives, Jason still has a chance to get some answers. However, he’ll form a backup plan just in case Faison bites the dust. Jason will tell Carly (Laura Wright) that there’s someone else who can help him. It seems he’ll be referring to Heinrik. Jason will be determined to learn the whole story one way or another. Meanwhile, Maxie (Kirsten Storms) will worry about Nathan’s fate. At least taking Jordan’s (Vinessa Antoine) questions will distract her briefly. General Hospital spoilers say Maxie will explain how everything went down at Crimson. She’ll talk to Jordan and Bobbie (Jacklyn Zeman) about those terrifying moments. Nathan ultimately saved Maxie, but Peter’s (Wes Ramsey) efforts were also quite heroic. Jordan will be confused when Maxie says Peter was shot. GH fans may be pretty confused as well! Peter went down hard, but there was never any sign of blood. He eventually hoped back up and got some help for Nathan. Perhaps Peter secretly anticipated his confrontation with Faison. He might’ve been wearing a bulletproof vest. Regardless, Peter will continue to spy on Anna (Finola Hughes) this Monday, January 29. She’s waiting for Heinrik in the park and Peter seems to be just the man she’s looking for. Anna will hear some rustling in the bushes. She’ll raise her weapon and ask who’s there. Will Peter show his face? It’s possible, but Peter probably won’t confirm his identity just yet. GH established a lack of trust between these two in their previous scenes, so Peter may be wary. Other General Hospital spoilers say Dante (Dominic Zamprogna) will ask Nina (Michelle Stafford) and Valentin (James Patrick Stuart) about Lulu (Emme Rylan). He knows she was headed to Wyndemere earlier, but he hasn’t been able to get in touch with her. Dante will provide updates on the Faison situation, but Valentin and Nina will look clueless. Fortunately, it appears Lulu found an escape route through the tunnels. She’ll be reunited with Dante and Dr. Obrecht (Kathleen Gati) will get some medical attention. As for Nathan, he’ll live at least a little longer. General Hospital spoilers say Nathan will have another opportunity to speak with Maxie soon. After that, a faked death is always an option. It sounds like more excitement’s ahead. We’ll keep you posted as other GH news comes in. Stay tuned to the ABC soap and don’t forget to check CDL often for the latest General Hospital spoilers, updates and news.